Now that Sri Lanka’s military has eliminated the terrorist factor, what remains is the need to vanquish the caste and class divisions that continues to remain unabated. While the military continues to do a remarkable service it is now left to the civilians to abandon centuries of discrimination and to allow these marginalized Tamils their right to live just like the high caste/class Tamils. The rights of Tamil children taken and made into child combatants, the rights of women often raped, drugged or brainwashed leaving them no choice but to become suicide cadres were all silently acknowledged by Colombo-based Tamil political parties. Over the years LTTE took one after another to make them part of their terror outfit. That silence was because these Tamil children, women and men were not high caste or high class Tamils – they were all low caste Tamils that were shown no empathy or sympathy from other Tamils but became tools to showcase a different story, a story of Sinhala oppression that would enable high caste/class Tamils to reap the benefits. However much Tamils may try they cannot deny or excuse the many riots that have taken place over decades because Tamil low castes could not bear the unfair and unjust treatment of their own people. Mullaitivu is just one of the districts that formed a nexus of these low caste non-Vellala Tamils to be recruited to the LTTE. Today, the entire district comprising 6 AGA divisions (Maritimepattu, Oddusuddan, Puthukudiyirippu, Thunukkai, Manthai and Weli Oya) is a home to a little over 90,000 Tamil civilians, 34,000 of whom are located in Maritimepattu. Little does any observer need to be told how appreciative these ordinary men and women are for the manner Sri Lanka’s armed forces continue to assist them. Contrary to what Colombo-based Tamil politicians taking orders from neighboring India will declare, the people of Mullaitivu have struck a close bond with the military having realized that they are not the enemy afterall. 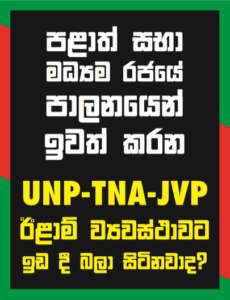 It is natural for the military to be regarded as they have been when these people have been told day in and day out nothing other than the cruelties inflicted by the Army and the Sinhalese people. To change that attitude and fear it not only takes time, it needs the patience of the military and the understanding of the ground realities that prevailed for these people to think so. Nevertheless, the army has certainly won the people over and it is this victory that has Colombo-based Tamil politicians desiring to continue the caste/class divide using the Sinhalese once again that is attempting to try all sorts of googly’s. There is much that the people of Mullaitivu are thankful for. Other than being a contributing factor to the LTTE in terms of men and women, these people have had no other life to enjoy. Today, the roads that were once used to carry out terrorist attacks, narcotics and other illicit practices has been carpeted and people have benefited by the infrastructural developments taking place spearheaded by the military. The road from Mankulam to Mullaitivu, Paranthan to Mullaitivu, Pulliyankulam to Mullaitivu, Weli Oya to Mullaitivu are being carpeted. The men are today not holding arms and ammunition but able to engage freely in some form of livelihood with many taking up to fishing, agricultivation and other small businesses. Even the women have begun to start small enterprises of their own. There are already over 75 government schools in operation and children have no fear of being kidnapped and turned into killers by Tamil tigers. To understand exactly how these civilians feel happy in a habitat without guns and killing, people need to do more than just give out statements from Colombo ridiculing the armed forces. The military has successfully completed over 250 houses and gifted them to families strengthening further the ties that are building between the Tamil civilians that have suffered through decades of LTTE/Tamil politician hostility. It is this bond that has helped to make them feel that their safety is being looked after and protected by Sri Lanka’s military which has suddenly got the Colombo-based Tamil politicians to panic in view of the possible collapse of their power over their own people if this bond stretches to other districts of the North. While the military has built 250 houses the Indian Government has succeeded to build 50 only of the 50,000 promised in Maritimepattu using Indian materials brought in from India. This certainly showcases the effectiveness and efficiency of Sri Lanka’s military. Nevertheless, while acknowledging attempts to continue subversive activities and to once more instill a divide amongst the Tamil people against the armed forces what is also true is that there is a limit to what the armed forces can do. The fact that the uniform is in itself an automatic divider is something we need to admit. Therefore what is now needed is for the Government to use its line ministries to passionately take on the task of administering the peoples needs that is part and parcel of what they are paid to do. What needs to be mentioned highlighting the limitations to some of the civilian efforts is that the caste/class barriers existing amongst the Tamils is manifesting itself in the public sector service mechanism too. A good example is when Government appointed officials in key areas like education turn out to function with a lackluster attitude because they belong to the high caste and do not wish to uplift the status of their own people. The people of Mullaitivu are disgusted with the situation wherein most feel that they were ruled by Jaffna Tamils and the Jaffna Tamils want to continue to ruin them even now. The Government cannot recruit looking at people’s caste or class neither can a Government look at the caste/class in determining which Tamil public servant should serve. Naturally as a Tamil, we would expect all Tamils to be keen to undo 3 decades wherein children of the areas like Mullaitivu have been neglected educationally and socially. Nevertheless the truth of the matter is far different and is posing a greater tragedy to the reconciliation. Foreign governments seem to have neglected to place the significance of the caste/class factors that divide Tamils which is far more detrimental than the bogus propaganda promoted about Sinhala oppression. The Colomb-based Tamil politicians themselves part of the higher class/caste are all the while attempting to hide this truth. What needs to essentially be done is to create more communication channels – open forums that villagers can come face to face with public officials and put across their issues. This is what leads to severe criticisms about Sri Lanka’s public service something shared by all the citizens throughout the entire country. Once again what the Government needs to realize and what the President needs to wake up to is that his entire legislative bodies from Ministers, to the line Ministries, their officials, advisors, consultants and trickling down to the public sector need to realize they are supposed to be working for the people and that service now needs to rejuvenate itself from the pace it is currently functioning in. There is a limit to what the military can do to make up for the shortcomings of the public sector apparatus and this calls for the President to intervene to wake up the entire public sector of Sri Lanka.